Which Brass Ring for You: Popularity or Success? Autistic Students: Are We Asking Them to Do Their Best While They Feel Their Worst? HPV Vaccine And Cervical Cancer: Is it worth vaccinating? The Human Papilloma Virus, HPV for short, is responsible for one of the most widespread sexually transmitted infections in the United States. More than 20 million women are currently infected, and more than 6 million new cases are detected each year. Moreover, it is estimated that at least 50 percent of sexually active people will be infected during their lifetimes by this "silent" infection that in most cases has no symptoms. Two strains of HPV cause approximately 70 percent of all cervical cancer cases, striking more than 10,000 women in the United States alone each year. So it is with great fanfare that, in 2006, the United States government approved an HPV vaccine that was tested around the world and is being marketed with optimism to prevent infections from certain types of HPV. However, hope quickly turned to controversy as various groups objected to proposals at the state government level to make this vaccine mandatory for girls as young as 9 years of age. In this timely book, Dr. Krishnan explains both the infection and the vaccine to parents, women, men, and teenagers who are interested in this issue. A longtime gynecologist and family physician -- as well as the mother of a young daughter -- Dr. Krishnan addresses the controversy and legislative aims to require the vaccine, including the pros and cons of being inoculated and whether boys should receive the vaccine. 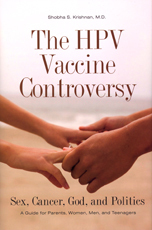 Parents, young adults, and teenagers considering the HPV vaccine will find answers to their questions in this book. The book features a chapter listing the questions asked and answers given when Krishnan ran an informational clinic for college students who were curious about the infection, its disease consequences, and the role of the new vaccine. The book also addresses the issue of vaccine booster shots and what is known about the side effects. In addition, it discusses whether the vaccine can protect boys from contracting or transmitting the virus and acquiring genital warts and HPV related cancers. A final chapter highlights personal stories and anecdotes about cervical cancer from women in developing nations, as well as the potential role of this vaccine for alleviating HPV related diseases in those countries.